Everyone enjoys a little haunting every now and then. And that’s what you get a story you won’t be able to turn loose long after reading the words “The End.” Jennifer McMahon leads us all down a rabbit hole of lies and deceit in this disturbing haunting, psychological thriller, and paranormal page-turner. Many kids have big imaginations and imaginary friends to keep them entertained. Parents think it’s cute, and give little thought to any of their imaginings being real. But if you lived near Reliance, a village that mysteriously disappeared one day, you might believe in the paranormal too. You might surround your bathtub with iron to keep away the things that live among the shadows. Fifteen years after Lisa told everyone she was crossing over to the world of the fairies to meet the Fairy King and disappeared, her brother Sam wants to find the truth. 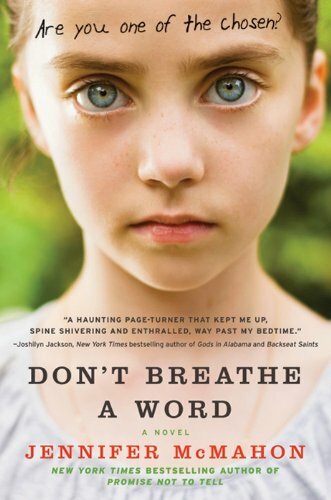 In Don’t Breathe a Word: A Novel by Jennifer McMahon introduces us to a family ravaged by loss. Like me, you will not be able to put this book down until you find out what really happened to Liza. You’ll keep the lights on long after you finish reading the last page. Can you recommend a good FridayReads for us? Do share your lasted book find! Previous Do you want more oomph in your story? Next What makes for a unique story? I’m gonna have to check this out!